When a Philippine court sentenced former First Lady Imelda Marcos to 77 years in jail for corruption, her lawyer was taken ill, but not Imelda. She simply shrugged off the verdict handed down on November 9 and went partying that night. Her daughter Imee was holding her 63rd birthday party with guests that included President Rodrigo Duterte’s politically powerful daughter, Sara, who is also the mayor of Davao, and former presidents Joseph Estrada and Gloria Arroyo. None of the guests hesitated to be photographed with the 89-year-old felon, Imelda. In fact, Senator Cynthia Villar quipped that the verdict was “bad timing” indeed, coinciding with Imee’s birthday. Villar, spouse of the second-wealthiest man in the country, had reason to complain. After all, the couple’s Nacionalista Party had just fielded Imee to run for the Senate next year. The fact that she partied but violated court rules by not appearing during her sentencing was not lost on Associate Justice Rafael Lagos, whose division will now have to decide whether she goes directly to jail or continues to enjoy “provisional liberty” while she appeals the unanimous decision. That Marcos was convicted of seven counts of graft for laundering over US$231 million through her secret Swiss accounts is unprecedented. It yanks wide open a window into the alternative world that Imelda and her husband, Ferdinand, once inhabited. While Ferdinand was busy building “a New Society”, giving the military free rein to torture and kill thousands to keep him in power (according to an equally historic decision penned by Judge Manuel Real of the US District Court of Hawaii awarding damages to the regime’s human rights victims), Imelda bewitched the masses with her statuesque beauty and arts and culture projects evoking “the true, the good and the beautiful”. In court, she has refused to give any proof of ownership yet insisted everything was legally acquired. The seven criminal cases that led to Imelda’s conviction are but a fraction of the 38 civil lawsuits, 78 criminal lawsuits and one forfeiture case filed against her in 1991 before the Sandiganbayan court. She has a total of 415 co-defendants in these cases, according to Associate Justice Mary-Ann Corpus-Manalac, who wrote the 70-page ruling. The problem facing prosecutors then was how to pin charges on Imelda for funnelling money to Switzerland and diverting part of that to buy prime properties in New York, when these had nothing to do with her official acts as the second most powerful person in the country. Ferdinand had created a Cabinet post for her as Minister of Human Settlements and also made her Governor of Metro Manila. State prosecutors found the answer in an old law, the Anti-Graft and Corrupt Practices Act of 1960, and in the 1973 Constitution that had legitimised what Ferdinand Marcos called his “constitutional authoritarianism”. Both legal documents had asserted no Cabinet member could “participate in the management of any business”. 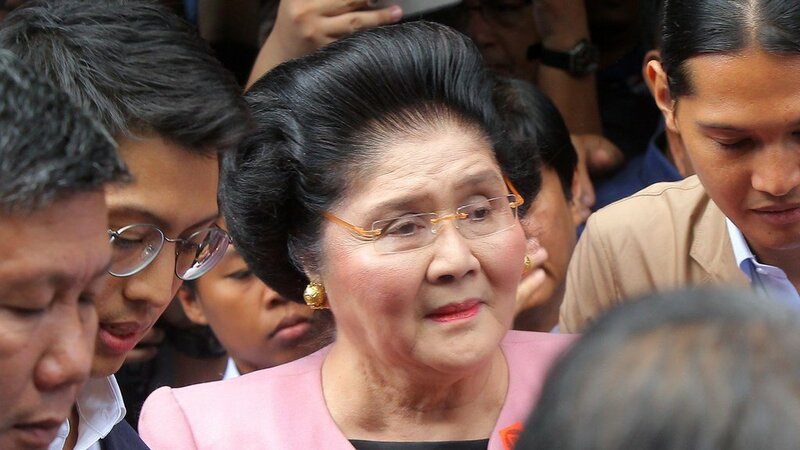 Prosecutors then decided to concentrate on specific foundations formed by Imelda Marcos under the names: Maler; Trinidad; Rayby; Palmy; Azio-Verzo-Vibur; Avertina; and Rosalys-Aguamina. 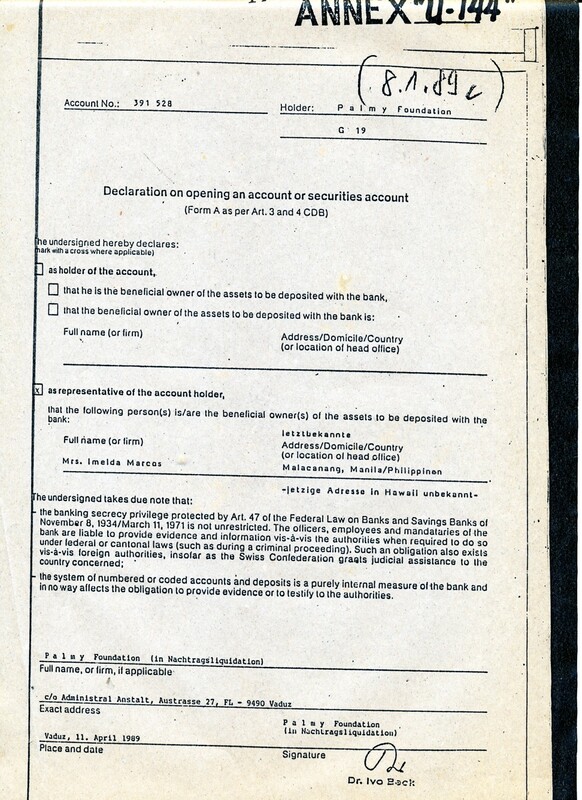 Manalac’s decision noted a Supreme Court ruling in 2003, awarding the Marcos Swiss deposits in favour of the State, and said: “management of businesses, like the administration of foundations to accumulate funds, was expressly prohibited under the 1973 Constitution”. To illustrate the complicated financial transactions Imelda (and her husband) undertook to squirrel away money and at the same time conceal ownership of it, a case in point is the Trinidad Foundation. The foundation – likely named after Imelda’s late mother, Remedios Trinidad Romualdez, who died penniless – was established on August 26, 1970 by Markus Geel on Imelda’s orders, according to papers she had accidentally left behind in Malacanang Palace. 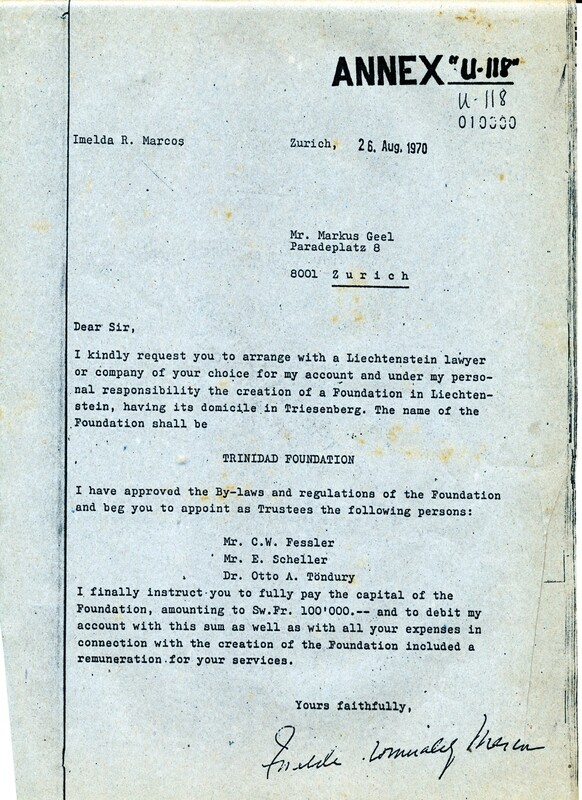 Based on the foundation’s “regulations” that she personally signed in Zurich on August 28, 1970, Imelda named herself the “first beneficiary” of both principal and interest. Trinidad’s “capital” of 100,000 Swiss francs (US$99,055 in today’s money) came from another account. 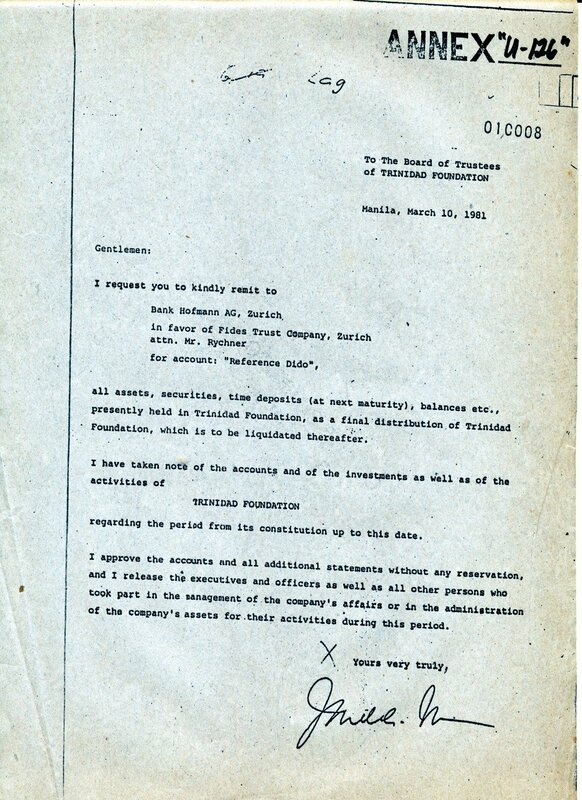 On June 22, 1973, Imelda established another foundation called Rayby and instructed a Dr Theo Bertheau to withdraw the initial sum from the Trinidad Foundation. Again, she named herself the sole beneficiary. Before the funds transfer could be pushed through, she wrote an order dissolving Rayby. “On the same date, she issued a written order to the board of Trinidad to dissolve the foundation and transfer all its assets to Bank Hofmann in favour of Fides Trust Co,” Justice Manalac noted. On May 13, 1981, the Palmy Foundation was created in Vaduz. Among its board of directors was Dr Ivo Beck and Limag Management, a fully owned subsidiary of Fides Trust. Palmy then opened an account with SKA (Schweizeresche Kreditanstalt or Swiss Credit Bank). Palmy did not tell the bank that Imelda was the beneficial owner. Palmy merely said Fides Trust was its fiduciary or trustee. However, the prosecution was able to link Palmy and Trinidad by noting securities previously registered under Trinidad were the same ones listed later under Palmy. The Trinidad-Rayby-Palmy Foundations were firmly linked to Imelda by no less than Imelda’s trustee, Dr Ivo Beck. Before Swiss authorities, Beck signed a declaration “stating that the beneficial owner of Palmy Foundation is Imelda”. An SKA official named G. Raber also signed a separate declaration before Swiss authorities that Palmy Foundation was owned by the “Marcos Familie”. Why did Swiss banks officials, then notable for their discretion and willingness to accept money from authoritarian rulers, suddenly turn around and incriminate their clients? In 1986, the Marcos family tried to withdraw money from their Swiss accounts but the scheme fell apart and caused the Swiss government to declare a unilateral freeze on their assets. The only way left for the Philippine government to recover the loot was through a tedious legal route. First, Manila had to sign an International Mutual Assistance on Criminal Matters Treaty (IMAC) with Switzerland in 1989. The treaty enabled the Presidential Commission on Good Government to obtain bank documents and declarations from bank officials and the Marcoses’ trustees. PCGG had been created to chase the Marcoses’ ill-gotten wealth via president Corazon Aquino’s first executive order. In their haste to flee, the Marcoses left behind a treasure trove of documents on their financial transactions. 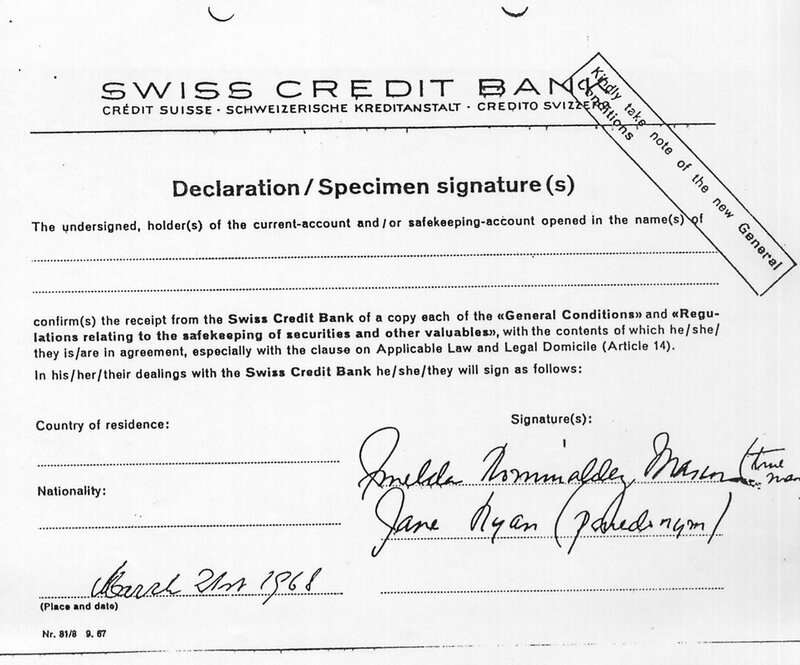 These documents were authenticated and verified by Swiss bank officials and the Marcoses’ trustees, through the IMAC. The Swiss documents failed to arrive in time for Imelda’s anti-racketeering trial in New York where federal prosecutor Rudolph Giuliani was prosecuting Imelda for raiding the Philippine treasury to buy four New York buildings. The American jury was unimpressed with the flowcharts the prosecution had prepared, showing the money moving from a Philippine bank the Marcoses secretly owned to a Hong Kong bank, which then remitted it to the couple’s numbered Swiss accounts. Then the money was forwarded to an account of Imelda’s friend in a bank in Italy, who then remitted it to New York for the purchase. The jury apparently believed what Gerald Spence, Imelda’s lawyer, told them: she was only a housewife and her only crime was “loving a man for 35 years …[and] taking his lavish gifts,” referring to the buildings. The jury acquitted Imelda in 1990, enabling the Marcoses to brag that no Marcos had ever been convicted. Despite the release of damning Swiss documents, Imelda’s graft cases moved at a snail’s pace. The late PCGG chairman Jovito Salonga wrote in his book, Presidential Plunder, that Imelda successfully used delaying tactics. She changed lawyers often. She kept dangling the prospect of a monetary settlement in exchange for dropping all the cases. She also called in favours, especially from judges. Before her recent conviction, Duterte said he had discussed with Imee Marcos the family’s offer to settle, and he was open to it. Former PCGG commissioner Ruben Carranza, however, said the 2003 Supreme Court ruling – declaring all Marcos-claimed assets beyond US$304,372.43 as stolen – forever barred a settlement. Instead of a settlement, Carranza prodded the Ombudsman and Commission on Elections to investigate Imee Marcos “criminally” for running for a Senate seat using the loot her parents stole, which “she knew of and helped conceal the crime”. In 2011, Imee declared a net worth of 27.9 million pesos (US$524,842). In 2013, the International Consortium of Investigative Journalists (ICIJ) uncovered financial documents naming Imee a beneficiary and “financial adviser” of Sinta Trust, a British Virgin Islands company. Also named beneficiaries were her three sons: Ferdinand, Matthew and Fernando. When asked by the ICIJ about Sinta, Imee did not respond.